Ulysses contains several references to "the Ship," a public house on Lower Abbey Street, which runs east from O’Connell Street (Sackville Street in 1904), only two blocks north of the Liffey in the heart of downtown. Stephen Dedalus and Buck Mulligan make plans to meet there for drinks, but Stephen skips the appointment and instead sends Buck a taunting telegram at the Ship. Much later in the book, Stephen and Bloom discuss the possibility of meeting at the tavern for continued conversation. The meeting is not to be, though the book never represents Stephen's decision to avoid it. In Proteus he thinks of obligations, first to Deasy and then to Mulligan: "I mustn't forget his letter for the press. And after? The Ship, half twelve. By the way go easy with that money like a good young imbecile." Does Stephen think, from an unaccustomed access of prudence, to dodge the predatory plan that Mulligan has expressed in Telemachus to "have a glorious drunk to astonish the druidy druids" at the expense of Stephen's "Four omnipotent sovereigns"? It's tempting to suppose so, but at about the same time that he had agreed to meet Mulligan for drinks, Stephen treats the hangers-on in the newspaper office to drinks. Financial prudence seems less important to him than an aversion to Mulligan himself. § Whatever reasons Stephen may have for dodging the meeting, the book supplies one of its own, via the network of parallels with Homer's Odyssey built up in the first chapter. At the end of Book 2 of the Odyssey, Telemachus ships out of Ithaca, to inquire about his father on the mainland. On his return at the end of Book 4, Antinous and nineteen other suitors lie in ambush for him behind an island that he must pass. Athena helps him to escape the deadly trap. Stephen similarly evades his antagonist. Instead of meeting Mulligan at the pub he sends him a taunting telegram from only a short distance away. We learn of this development in Scylla and Charybdis, when Mulligan finds Stephen in the library and Stephen thinks (in Shakespearean idiom), "Hast thou found me, O mine enemy?" Shortly later in the episode, Mulligan regales him with the experience of receiving the telegram: "Malachi Mulligan, The Ship, lower Abbey street. O, you peerless mummer! O, you priestified Kinchite!" In Ithaca, the narrator enumerates a series of "counterproposals" to Bloom's proposal (declined by Stephen) to have Stephen stay the night at 7 Eccles Street. 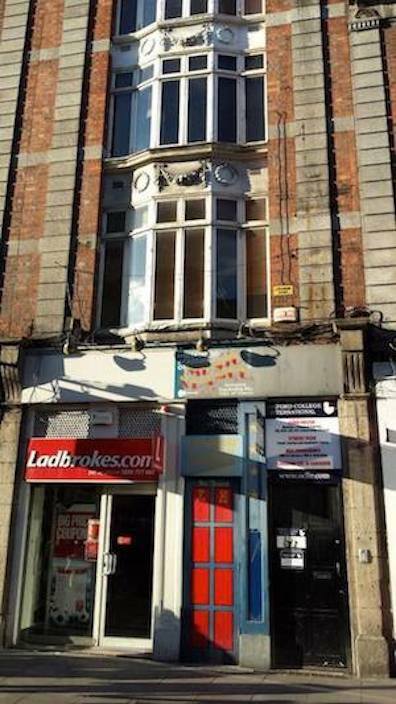 One of these is the idea that they will meet at "the Ship hotel and tavern, 6 Lower Abbey street (W. and E. Connery, proprietors)." Pretty clearly, this suggestion must have come from Stephen and it indicates a desire to have Bloom replace Mulligan as a guide and advice-giver. The reference to the Ship in Ithaca, then, confirms Bloom's role as Odysseus, the counterpart to Mulligan's Antinous. 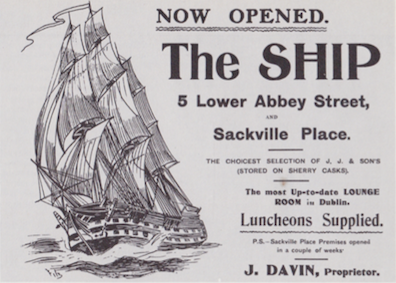 Poster, date unknown, announcing the opening of The Ship. Source: Cyril Pearl, Dublin in Bloomtime. The streetfront of the former Ship today. The tavern was rebuilt in 1917, after being destroyed in the Easter uprising of the year before. The bay windows continue to evoke the captain's cabin at the stern of a ship. Source: Gareth Collins. 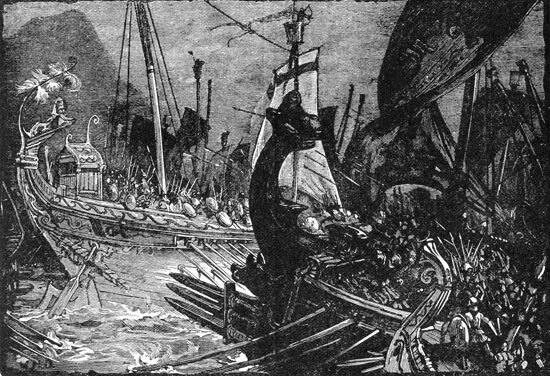 Greek triremes engaging the Persian fleet at the battle of Salamis in 306 BC, artist unknown. Source: fouman.com.